Bracebridge! 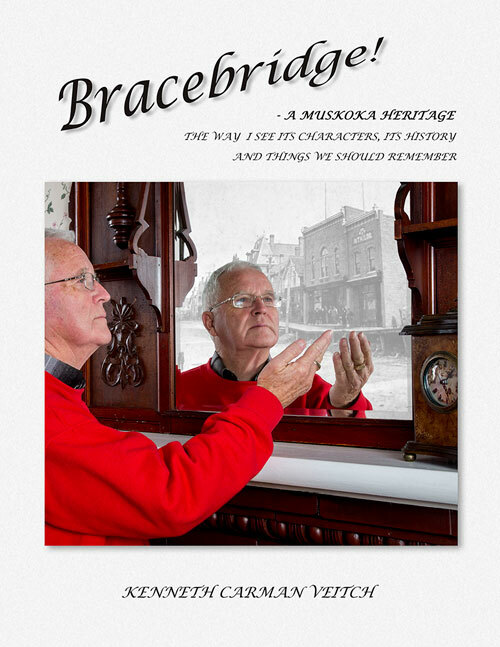 A MUSKOKA HERITAGE is an intriguing, easy to read description of the trials and tribulations of the explorers, surveyors, adventurers, pioneers and settlers that travelled through and settled the Bracebridge area of the District of Muskoka in Ontario, Canada. It describes some of the zany characters and their antics, the pioneer entrepreneurs and highlights features of the Bracebridge/Central Muskoka community. Sometimes humorous, sometimes sad, it is based on the many books, manuals, and newspaper reports written on the Bracebridge area, and the writers own experience. It also includes quotations from the personal diaries of some of the pioneers and early settlers that describe the desperate situation faced by those who came to Muskoka thinking that it presented the glorious agricultural opportunity that was advertised in the widely distributed promotional material. Much of the material was very misleading and as a result thousands suffered indescribable hardships. The writer, who grew up in the small settlement of Ufford near Bracebridge amidst the descendants of those early settlers, had the fortuitous opportunity of talking with those who knew first-hand the difficulties experienced by their ancestors and from a young age developed a strong interest in the history of the area. To purchase this book for $35.00 plus shipping. please click on the Buy Now button below. To use your credit card click on the PayPal site that appears, click on the "Don't have a Paypal account?" choice. - and stories people tell me! A 91 page true life story of growing up in a pioneer Muskoka community telling of many, some happy, some sad, tales as seen through the eyes of a child and young adult. To purchase this book for $25.00 plus shipping. please click on the Buy Now button below.